It is housed in two buildings. The OLD building, built from carved stones is next to the Town Hall building. In the NEW building, the huge statue of Kouros and a sculpture by Samios Genelaos (6th century B.C.) devoted to the goddess Hera are exhibited here. It is located in the village of Mitilinioi, (12 km from Samos town) and it is comprised of the Peleontological and the Natural history sectors. A tunnel with two entrances, dug in the middle of the mountain, used to be the water pipe by which the town was supplied with water. 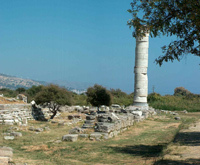 This is one of the Polycratian constructions, constructed by Eupalinus, an engineer from Megara. The length of the tunnel is 1.037 m. Through this tunnel, water was carried to Polycrate's town. Next to the church of Metamorphosis rises this historic castle. Temple of the goddess Hera. It was the temple of the goddess Hera.It had a length of 108.75 m, width 54.68 m and height 25 m. It had 133 columns only one of which is still standing today.